Saatchi Art’s curators have worked with artists from around the world to hand-pick every artwork we offer on Limited in order to provide you with an unmatched selection of limited edition prints. We are proud to offer "Maple on Prussian Blue/Copper/Gold" by Lily Greenwood, which is available exclusively on Limited. Artworks in a limited edition have a set number of prints available for each size offered. For the 10x10 size edition, "Maple on Prussian Blue/Copper/Gold" comes in a limited edition of only 100 prints. Once all 100 of the prints in this edition size have sold out, there will be no other prints of "Maple on Prussian Blue/Copper/Gold" available in the size of 10 inches high by 10 inches wide. Limited edition prints of this artwork may be available in other sizes. The crimson maple leaves are set to a background of dark prussian blue with glowing orbs of copper and gold. The orbs are open to interpretation, perhaps lanterns reflected on water at night. A varnish finish adds texture and depth. The color palettes are designed to be vibrant and bold without being garish. 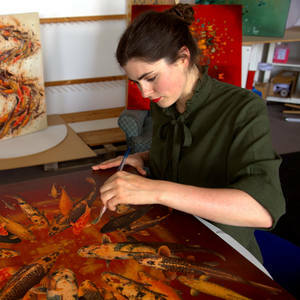 Lily has developed a unique way of working, using reproductions of her own paintings as collage material on a canvas. The maple leaves are meticulously painted, reproduced, and cut, ready to use on the canvas. The background is painted with acrylics. The use of collage allows the freedom to play with the composition in a way which would otherwise be impossible, allowing quick changes until a design is settled upon. When the collage is fixed in place, washes of ink have been applied. Finally, a glossy varnish enhances color, adds protection, and offers an opulent shine. Nature is common to all of Lily's work, however she would never claim to offer gritty realism. Lily describes it more like focusing on an aspect of its beauty and running with it, seeing where it can be taken. Simplicity is key, which to Lily means creating something which people can hopefully take some pleasure and enjoyment from. The canvas is stretched on a deep edge wooden frame with painted sides. Included is a made to measure floating frame, which is easy to remove if preferred. The frame is finished with Littlefair's water based non-toxic water stain in 'Red Mahogany'. Ready to hang. Please be aware that this canvas has a gloss finish, and surface texture/relief as a result of the layered collage material and varnish. This has been portrayed as fully as possible through the additional photos. Dimensions listed do not include frame. “Natural subjects are my starting point, and I love seeing where they take me,” says Lily Greenwood. 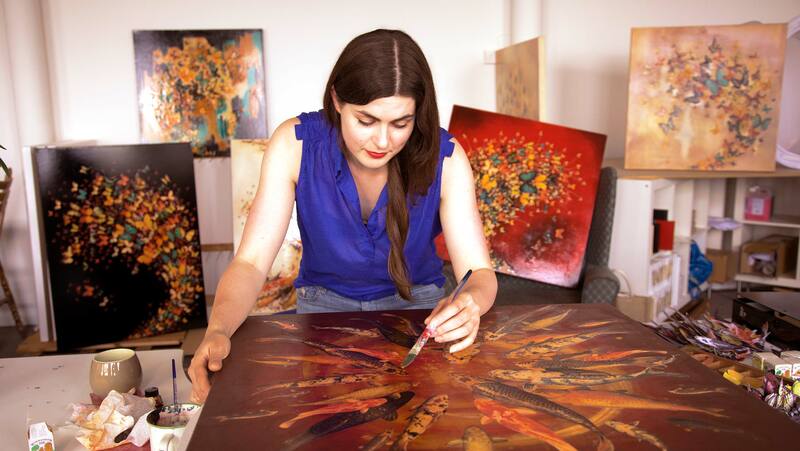 Flurries of butterflies, koi fish, and foliage explode in rich colors in her works, which pull inspiration from Japanese kimono design and printmakers.